I did another morning bake this morning, I've been wanting to do a simple recipe from Usborne Children's Book of Baking Cakes (You see how noob I am in baking?) and I decided to do it today. After an hour in the kitchen its all done! I gave 1 to DinoBoy as his breakfast, while he was enjoying it I got myself ready and soon we were out of the house, not before packing 4 of them in a container for later in the school. I didn't really take a good look at them except for the few seconds while trying to take photos to post in instagram. Later, after a morning of mad rush and happiness in taking photos in the school, I was sitting on the bench and suddenly felt hungry, I took out the container and grabbed one of them. 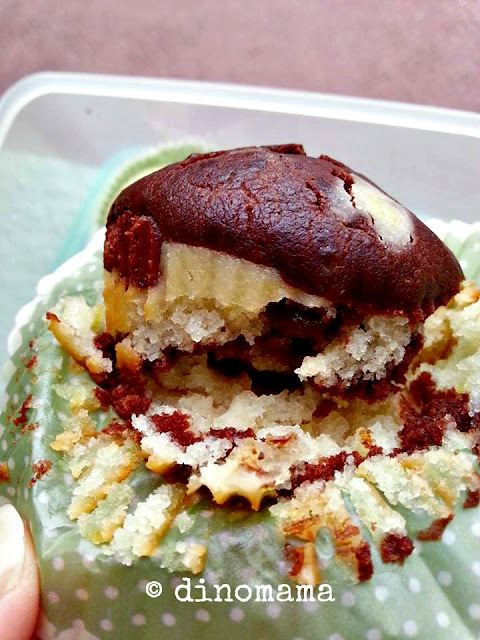 I was examining it and realized that the white portion is kinda pale, not the usual golden color I got from my cupcakes (the golden spots you see are the lemon zest). I had a little bit trouble trying to remove the paper cup as the cake sort of stuck to it, when I pry the paper away it fell apart (as you can see from the photo below). Perhaps its because I did not let it cool down further before I put them into the container? Then she asked me IS IT A CUPCAKE OR MUFFIN? I was stunned for a moment... seriously I have NO IDEA! I only know its chocolate marbled... something... I was so engrossed with the recipe trying to make sure I got the steps and portions correct and did not pay attention to the title. That afternoon, I went straight to the book the minute I stepped foot into the house and the mystery is solved. 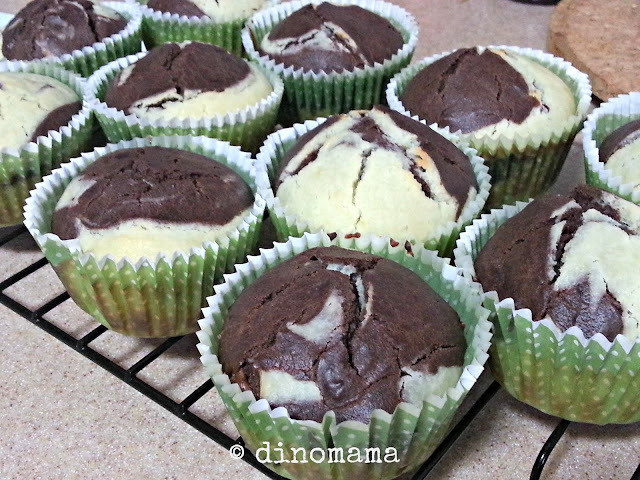 It is a Marbled Muffin recipe I did this morning. Oh wait... I still do not know why the white portion is white and not golden brown. I don’t know why it is not golden brown, but it sure looks scrumptious to me! Did it taste fabulous? One of the greatest things about baking is that you can make each recipe your own. Now you can go back, bake that recipe again, and recall all that perfection advice you got. You can also remember what you liked about the taste and the feel of it, and make sure to keep those things - do it the way you like! That is what makes a baker! Elizabeth, there are melted chocolate buttons in the middle so it does taste fabulous! 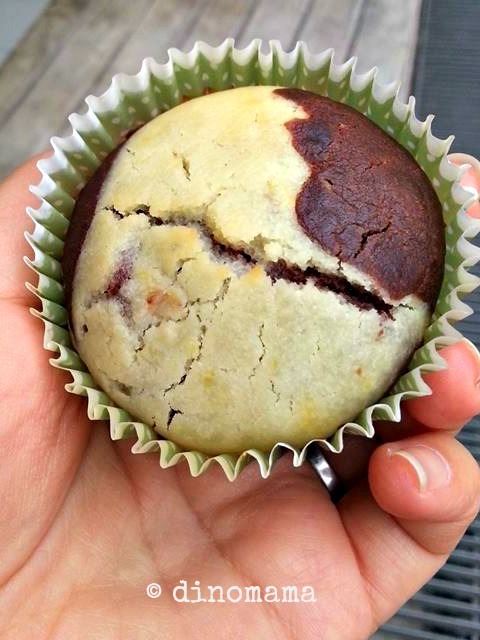 A big hit with DinoBoy hahah~ who breaks the muffin up and dig out the melted chocolate. Oooh - and the white part looks cream cheesy to me -was that in the recipe?